Abstract : As noted almost a decade ago, HCI (Human-Computer Interaction) aspects of visual language environments are under-developed. This remains a fact, in spite of the central role played by user interfaces in the acceptance and usability of visual languages. 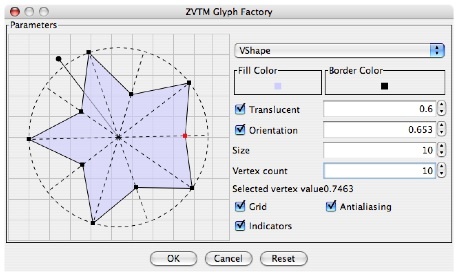 We introduce ZVTM, a toolkit aimed at promoting the development of HCI aspects of visual environments by making the creation of interactive structured graphical editors easier, while favoring the rapid integration of novel interaction techniques such as zoomable user interfaces, distortion lenses, superimposed layers, and alternate scrolling and pointing methods.